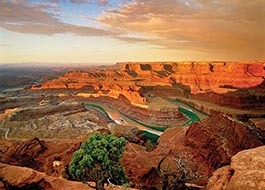 Hiking in Canyonlands is a truly rewarding experience. Every trail offers something different and amazing, sweeping views, hidden arches, artifacts or writings left behind by native peoples, or an opportunity to get truly off the beaten path to absorb the feeling of being alone in the vast red desert. Whatever experience you’re seeking, Canyonlands has 100 of miles of hiking trails for you to choose your pace and your adventure. The Island in the Sky District of Canyonlands is a vast mesa that sits upon sheer sandstone cliffs more than 1,000 feet above its surrounding territory. With many overlooks, each showcasing a different panorama of Canyonlands' magnificent landscape, a broad range of great hikes, and it’s easy accessibility, it’s clear why Island in the Sky is the most visited section of Canyonlands National Park. The Island in the Sky district of the park has much to offer in relatively close proximity. Start the day off with an easy jaunt down to the famous Mesa Arch - known for it’s perfect sunrise location. Next, challenge yourself with a moderate hike to Neck Spring - where hikers travel past seep springs, historic ranching sites, and an assortment of plant life. Stop for a picnic lunch at the Upheaval Dome trailhead, where tables and restrooms are provided. After lunch, a quick and moderate hike will take you to the viewpoints of the fantastic Upheaval Dome. Following your picnic lunch and Upheaval Dome experience, head south to Grand View Point - an easy hike along the edge of the canyon to the end of the mesa where incredible panoramic views await! Finish off the day watching the sunset from the Green River Overlook - a view like no other. The Needles District of Canyonlands National Park makes up the southeast corner of the Park. The Needles gets its name from the color-splashed sandstone spires that populate the area. 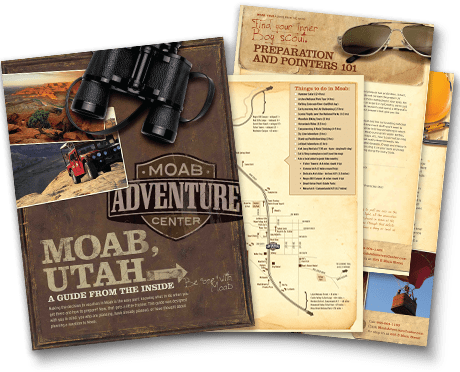 The Needles District, more remote than Island in the Sky, boasts tremendous hiking and backpacking trails, and four-wheel-drive roads. 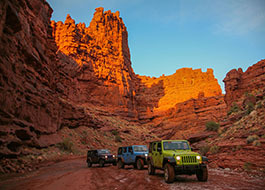 The maze is the most remote, rugged and challenging section of Canyonlands National Park. Visiting the maze requires a commitment of time (at least a few days), ambition, proper equipment (including a 4x4 vehicle), and self-sufficiency. If you can check all that off you list, then prepare yourself for an unimaginable, incredible, and unforgettable adventure! This strenuous trail takes a deep descent to the bottom of a canyon where you will find a panel with impressive rock art and intricate designs. Trail leads back up the steep climb to the top of the canyon. 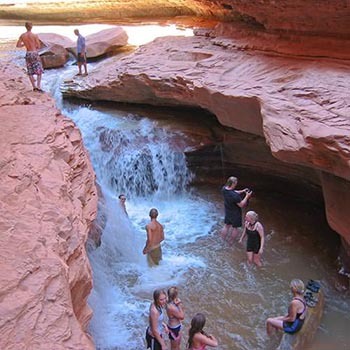 This strenuous hike is most easily accessible by hiking from the river to the rim of the canyon. A 1000 foot elevation gain/loss in 2.5 miles leads way to beautiful spires, tight slot canyons, and incredible river views. The Colorado and Green Rivers snake through the heart of Canyonlands National Park, and come together at what is known as the Confluence. 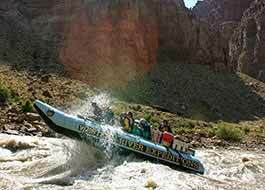 Below the Confluence awaits the legendary Cataract Canyon. Cataract Canyon is renowned for its class V whitewater, but let’s not forget about the canyon’s unbelievable hikes. This moderate hike leads along a ledge where ancient civilizations left behind rock ruins and images painted on the sandstone. Hike leads to a 20-foot waterfall and some ancient granaries and rock art. This short hike from the river has some incredible geologic features where wood has been fossilized and turned into stone. This strenuous hike has a elevation gain of 400 feet in .5 miles. The river loops a 4 mile horseshoe bend that is only about a 1 mile hike up and over the canyon rim.